Do you believe you are capable of so much more, but just don't know where to start? "Is this all there is..."
Or "How did I end up like this and what can I do about it?" Then take the Success On Purpose Challenge. Success on Purpose is the starting point for turning your visions into physical existence... a life you know is there waiting for you in your dreams... but you just don't know how to realize. We wrote this exclusive book and supporting training tools to give you a simple 3 step process to IMMEDIATELY put your life back on track. 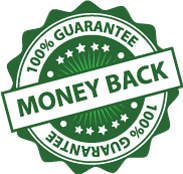 It has helped hundreds of thousands and I personally guarantee it will help you too. If it makes you feel comfortable, read every word on this page. If you feel like you are running in circles, pursuing the same old dreams and goals... if you want to feel a strong calling filled with passion and purpose... if you want to become all that you are meant to be... all that you know in your heart, you can be... get started right this minute. a life of PASSION, PURPOSE and MEANING. Develop a WINNERS Mindset™: Absolute Clarity... Unwavering Conviction... Total Commitment... and the Courage to overcome fear, uncertainty and doubt and take bold ACTION. This program is essential for people who need additional direction, advice and accountability. All digital delivery, no shipping! 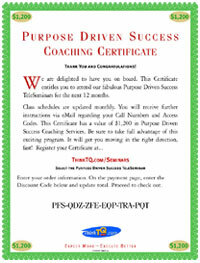 Order now and your account will be authorized for Quick Start Coaching and immediate access. It has been said that the two great tragedies in life are these: Not knowing your purpose—not knowing why you are here on Earth... and once you know your purpose—not LIVING it with passion and dedication... every single day you are alive. Just HOW can I live a life of passion and purpose? What, exactly, am I expected to do? How can I transform my life's purpose into an unstoppable mission... and ultimately achieve the success I desire, personally and professionally? The good news is that there is a simple formula for determining your life's Natural Mission—a formula that contains only 3 variables. Plug in your unique Visions, Values and Roles, and you will have the starting point for living your dreams and goals... the foundation for achieving Purpose-Driven Success. You will discover how your values, vision, and roles combine in your life... giving you inherent direction and purpose for every choice you make and every action you take... permitting you to create the life you were intended to live. By the time you finish reading this simple to understand book — and complete the personal exercises — you will understand your unique Purpose... exactly how your Natural Mission forms... and find Inherent Direction for your life. You will become a Purpose-Driven Success. You will discover—and achieve—your life's Natural Mission. An Hour By Hour Explanation of our guaranteed, step by step process of creative reinvention. Learn an amazing secret about success that is so simple, yet so profound... that just 3 variables -- all of which are under your complete control -- separate the world's most successful people from those who struggle just to make it payday to payday. In this inspirational hour, you will see that the key to your success comes down to just 4 words: High Expectations ~ Brilliant Execution. Develop the power to greatly expand your Expectations and your life becomes a living dream. Don't, and your life becomes nothing more than a slow motion nightmare. Connect the dots between theory and practice... by listening to a true story about a husband and wife who were drifting through life, both personally and professionally, until they found Success On Purpose. In this highly emotional hour, you will feel the pain and heartbreak Ben and Melissa felt, and the joy and elation they found when they put their lives back on the right road... the road to achieving their greatest hopes and aspirations. Learn that enduring success is a simple matter of triangulating your 3 personal variables into a Natural Mission... giving you an unstoppable sense of passion, purpose and direction. We will scientifically prove that ALL successful people have one thing in common: A highly evolved, virtually unstoppable sense of Mission. In this fact-filled hour, you will fully understand the Power of Purpose and why Defining your Purpose gives you a whole new approach to the age old problem of answering the question "Why am I here, and what am I to do with the one life I have to live?" You may THINK you know the answer to this question. However, if you are not fully utilizing your gifts and talents... not happy with where you are right now... not satisfied with the results you are getting... not living a life of meaning and significance... THINK AGAIN! Fully grasp the importance of your Natural Mission and Authentic Direction in life. Through 5 key case studies, you will see why it is virtually IMPOSSIBLE to achieve great things in life without your 3 core variables all being in the proper proportions and equally related each to the other. This is a fun hour where the aha's... the I get it's... the WOW I didn't have a clue it worked that way will start to flow! Learn how your Values, Visions and Roles — in the right combination and concentration — unite to give you absolute Clarity... absolute Conviction... and the reason to fully Commit to living your dreams. You will find the big WHY of your life in this hour... and be poised to do the work that will guarantee that the REST of your life will be the BEST of your life. By the end of CD 5, you will be chomping at the bit to pick up the book and DO the remaining work. You will be excited and enthused. You will be at the Starting Point for a true creative reinvention of your life. Discover an amazing truth about success. For you to actually LIVE your best life now... to actually LIVE a purpose-driven life... you must consistently PERFORM on purpose. In just 1 hour you will get the connection between your faith, belief, hopes and dreams... and your power to perform beyond your expectations. You will find strength and hope. You will understand why all your previous efforts fell short, and precisely what you can do to finally get control of the forces now controlling you. 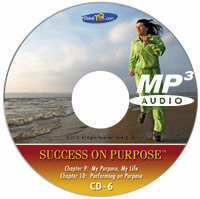 Simply listen to the 6 highly motivational, inspirational and educational CD's ONCE. In just 6 hours, you will understand exactly what you must do to take your success to the next level... to actually LIVE a life you will LOVE. Who Benefits MOST from Success On Purpose? Since the release of our first edition, we have heard from tens of thousands of our customers. Here is a short list of what men and women, from every walk of life, tell us they see... and why Success On Purpose is critical to your future. People battling battling all forms of medical issues who need to look beyond their illnesses... and find a REASON for hope... a REASON to put their whole heart into the battle. People who have given up all HOPE for living their dreams... people who have lost the COURAGE to see themselves WINNING... people who have started to believe that the worst of life is inevitable... and there is nothing they can do to turn their lives around. The common thread is people who are looking to renew, restore, reinvigorate and recreate their lives... and are looking for a new Starting Point for making the REST of their lives, the BEST of their lives. The Story Behind Success On Purpose. At ThinkTQ, Inc., we spend a great deal of time thinking about highly complex issues with the hopes of making them simple to understand—and more importantly—to actually DO. Being the world's leading publisher of virtual training products for personal and professional excellence, it's our purpose for existing. So, we see a crying need to help people understand one of the fuzziest, most misunderstood — yet critically important areas in life: A person's true sense of purpose and mission. Thus, we have created a "generalized" approach that is easily understood and gives you immediate direction... which, from our point of view, is the entire point of knowing your purpose. This is the Starting Point for not only improving your TQ, but also for immediately improving your life. The truth is, understanding your purpose in life is not just a good idea. It is everything. Without a clear sense of "Who Am I, and Why Am I Here," there is no need to improve your performance. You don't know where you are going, so there is no real need to help you get there any faster. However, once you truly understand your unique purpose, your performance is everything. Why? Because you want to actually LIVE your purpose—rather than just passively watch your life go by. Worse, they start believing the "Myth of Life"... that they are not "good enough"... not "smart enough"... not "rich enough"... or are too young... too old... the wrong education... not enough money... not SOMETHING enough. Pure bull. Understanding the root-cause of this lack of direction and purpose is important because the vast majority of people we test at ThinkTQ.com admit to having little or no direction in their lives... no strong sense of purpose... no strong sense of mission... no real passion for which they are trading the ONLY life they have to live. Not only are these people not living their best life now—they are dying inside each day—committing slow-motion suicide. This is a tragedy, since it is so easily corrected. Virtually every single person who has experienced Success On Purpose has had the same comment, "I wish I would have known this 10-15-20-25 years ago. My life would have turned out not only better, but I would have found those 3 key pillars of success: Happiness, Satisfaction and Significance." You do not need to burn up one more precious moment of the only life you have to live. You've been doing it the HARD way. There is an EASY way to the life you desire... one that takes the same amount of work you are already doing — maybe even LESS — but will produce the meaning you are sorely missing. It takes no more TIME to be rich than broke... it takes no more EFFORT to perform on purpose than go through the half-hearted motions and get little in return. We do not promise you a get rich quick hustle... or that you will be secretly transformed just by thinking positive thoughts. What we do GUARANTEE is you will find that which is MOST important to you... and will find an amazing new Starting Point for lasting success. 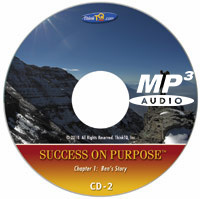 Since the initial release of Success On Purpose, Version 1.0 beta, we have had a tremendous out-pouring of comments, suggestions, testimonials and fabulous success stories... from people in every walk of life: Ministers, salespeople, executives, single moms, people who have lost hope, people looking to rekindle their dreams, people who are at the top of their respective professions and want to pass their successes on... indeed, people who want to live a life of passion and purpose. In reviewing a few of the letters, it struck me that maybe we should use testimonials from the clergy... as they not only have unimpeachable credentials... but understand the need for connecting the dots from a person's purpose and mission in life... to their actions/performance. It should be noted that Success On Purpose is not at all "theological" in nature, but helps people understand the importance of actually LIVING the "Purpose-Driven Life" Rick Warren so beautifully described. 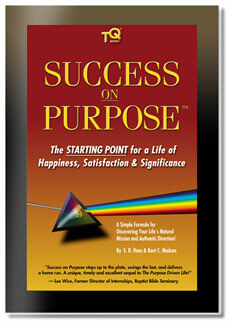 In a way, Success On Purpose is the performance-oriented followup to his inspiring and life-changing book. Where his book is about the big WHY of life... our book is all about the HOW... and was designed to give you the starting-point to get going and keep growing. Our point is well served by these select testimonials: To LIVE a life of passion and purpose... to LIVE a purpose-driven life... requires you to not just talk about it... think about it... or feel the inner-calling. No, to LIVE your Purpose requires you to PERFORM on Purpose. After all, when God tells me to do something, I have no other choice but to DO it. The "consequences" of failing to take the necessary actions to make it happen are, well, just too high a price to pay! "You have ONE life to live. What would you do if you could live a life of significance and importance—starting right now? What if you could really achieve all that you desire... all that you were meant to do... all that you were destined to accomplish in THIS lifetime? Well, you can. 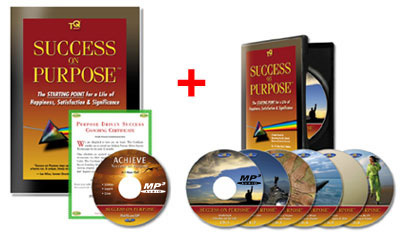 Success on Purpose offers a step-by-step, systematic approach to living the life of your dreams. There's nothing magical about it; it's practicality will help you overcome all your resistance points you may have about success. E.R. and Kent have taken the principles of success—and the enrichment of our soul's purpose—and organized them very clearly so that anyone who uses this system cannot help but attain a life of fulfillment. You WILL, as they say, become a Success On Purpose!" "I have read virtually every book on passion, purpose and mission ever written. 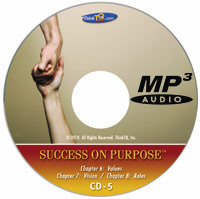 Success On Purpose is by far the best written, most practical and empowering book on BOTH success AND purpose I have ever read. It is the LAST book on the subject I will ever read. Thank you so much for creating it." "Through the creation of SUCCESS ON PURPOSE, you have not only given us a CLEAR understanding of how to create lasting hope by reconnecting us to our hearts, but also an effective and efficient systematic, sequential process for turning our dreams into a reality called LIFE—aka—'heaven on earth.' You have produced a methodology for continuous creation, evaluation and expansion via the highest level of contribution possible, given our unique talents, skills, values, visions, empowering roles, and worthy missions." 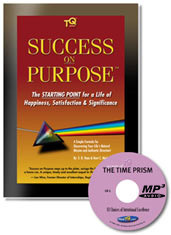 "The continued use, practice and exercise of the valuable principles and brilliant framework found in the metaphor of the Time Prism performance spectrum, enables us to tangibly choose and practice intentional excellence over intentional mediocrity, by identifying, choosing, developing, evaluating and applying the best behaviors, best patterns and best practices available to mankind. Thus High Expectations and Brilliant Execution results in seemingly no time at all. This is what doing, being and contributing our best at any given time and in the least amount of time necessary, is all about. Congratulations to you and the TQ TEAM." "When I finished reading Success On Purpose for the first time, I was astonished at how well (and how simply) you nailed the notion of Natural Mission and Authentic Direction! We are all on a Mission as Rick Warren says. No question, we all have a Divine Purpose guiding our lives and the multiple Missions we take on in this one life we have to live." "I was a little taken back when I came across St. Teresa of Avila's quote you used on page 62. It seemed out of place in a "success book" but it isn't..."
"I have seen this quote a hundred times before. It's the inspiration behind Habitat for Humanity... "No Hands But Yours." But somehow, when I came across it as you were discussing how your Natural Mission forms when you "triangulate" your Visions, Values and Roles, it jumped out at me as if Christ was saying to me, "Pay attention Paul... I can't change the world without YOU. I have given you a Purpose -- would you PLEASE get on it!" "If I am to do Christ's WORK... to live my Mission in Him... I have no option but to, as you say "Perform On Purpose!" "May God Bless You and Keep You in His Service." "Many thanks for a wonderful system." "Success On Purpose is among the top five things I wish I had when I was 21. Recently I found myself gravely injured, empty handed, almost literally with nothing but the clothes on my back, my dreams, and my values. Turning as soon as I was able to Success on Purpose, I find myself just six months later with a reinvented life. Each day is filled with hard work and commitment, but is exciting, guided by principles and values, some of which I discredited much of my life." "If TQ and Success on Purpose were a boat leaving a desert island, every other self-help book I've ever read might be usefully bound up for use only as ballast." 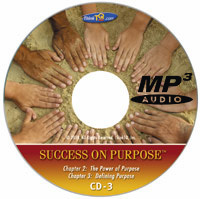 "Success on Purpose is a masterpiece of living, working, growing and flourishing—with, through, and among people. Use this book; consume it as though your life depended upon it—because it does. It's not about you; it's about everyone you will ever meet or love. Then go stomp the terra!" "In the field of personal development so many things can seem theoretical and abstract. It's called "all that touchy-feely stuff"—or worse." "This is not the case with Success on Purpose." "If you are looking for an immediate and practical means to make changes in your life, in a relationship, in an organization or business, using the principles and exercises explained in Success on Purpose, you will not go wrong." "In fact, it will bring you a beacon light flooding the path before you enlightening you and whoever else is involved in your creation of change and achievement like nothing else. You will know what you stand for, where you are going, who you must become to get there and what it will take each day and week to get yourself there." "This is pure creation for true achievement." "Shortly before I received my copy of Success On Purpose from E.R., I was reflecting on my greatest enemies in terms of what one might term 'success in Jesus.' Two of the enemies I identified were lack of self-discipline and busyness." "Personally speaking, I believe that anyone who identifies with these 'enemies'—regardless of their particular focus in life—will discover in Success on Purpose something extremely valuable: they will be given a practical, hands-on tool for identifying and capitalizing on their own major reasons for winning any challenge they may face in terms of their own self development." "While I approach life from a faith-based background and don't believe anything in print can replace an ongoing, intimate relationship with Jesus, I do consider Success On Purpose to be one of the finest resources available for assisting people in their pursuit of living a full and meaningful life." "Having served most of my life in one form or another in what might be termed a coaching capacity—including serving over twenty years as the Director of Internships in a seminary setting—I quite naturally gravitate to anything that provides people with concrete steps of action to help them become better persons. In fact, that's one reason I ended up requiring my student interns to acquire and use The Power Of TQ as a part of their internship training and why I recommend Success On Purpose: simply put, it is filled with those concrete steps of action!" "On a more personal note, I appreciate it when I can get to know a person well enough to sense their heartbeat regarding a particular endeavor, and I can say from my experience that E. R. Haas has reflected to me a consistent, passionate desire to help others discover their purpose and live a life of personal fulfillment." "Many thanks to E. R., Kent and the entire Success On Purpose team for not only the privilege of working with you on this project in a small way, but also for being a very positive influence to me personally, way before I was able to do so!" Will I choose to awaken motivated to follow a crystal-clear vision of my spiritual calling? Or, will I arise and allow life's circumstances to control me like a dandelion seed caught in crosswinds?" "How does one develop a crystal-clear vision of a spiritual calling or any calling, be it entrepreneurial, academic, or otherwise? Then, how does one move from a place of vision into action and follow-through?" "ThinkTQ's Success on Purpose is the best success-creation system I've ever come across. It is filled with more than just academic prose. It has easy-to-follow diagrams and methods which anyone can use to move from a place of confusion to a place of clarity, power and execution." 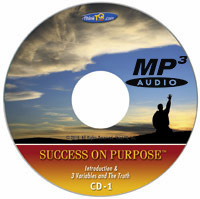 "ThinkTQ's Success on Purpose is a compass, a tool box and a teacher presented in the form of a success book. Success on Purpose empowers me daily to follow my dreams, but more importantly, using ThinkTQ's success system, I combined three important roles in my life to guarantee that I will not only live MY best life... but to help others do so as well." "Here is how I can best describe ThinkTQ, Inc. ThinkTQ is like a treasure island. If you dig in deep enough, you will locate their global well rich in resources and nutrients for the human mind, heart, body, and soul. The beauty about the ThinkTQ Well is that it runs 24/7 for anyone and everyone who is thirsty for both 'active' and 'PRO'active knowledge, and in need of exceptional, state-of-the-art resources as nutrients for bumping up expectations, and 'executing brilliant results instantly,' as my dear friend E. R. Haas always says." "I am a walking testament to you both after producing Legends in Excellenceª, and walking proof of how Success on Purpose rolls! Thank you E. R. Haas and Kent Madson, not only for creating a starting point, but for scientifically proving where one must PRO-actively begin to apply your provided fountain of knowledge consistently over time, in order to achieve brilliant results!" 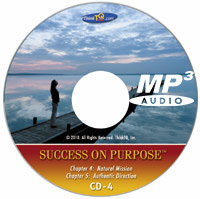 "Here's the bottom line: Success on Purpose—MORE than a Book, MORE than a Success Map, MORE than a Directional Performance Guide—it is your Starting Point to your Mission on Demand™ now, it is your key to unlock the greatest doors of your life, of your destiny, to fulfill your legacy in Intentional Excellence! So don't just read Success on Purpose, use it, turn it, open your success door, Expect More, Execute Better, and win, because you CAN!" Here is my blurb: "This book was a vehicle of revelation for me." I consider myself just an average guy, but if you put a blurb like that and say "Tim McFadden, Attorney and Doctoral Candidate in Theology, Oxford", it might carry more weight—I mean if you want to add mine to whatever else you've got, which I won't presume is worth it. But I do want to help! I see you guys working in a sort of Proverbs of Solomon space, yes? It's good practical wisdom about how things actually do work, regardless of how much noise one is making about "religion." There was that ancient Solomonic sense of Wisdom being the warp and woof of reality; and now we have the Logos of John 1 as the full revelation of this reality. So I think it glorifies God (who meets us everywhere certainly in daily life: it says he cares about how the stones in the trader's bags are weighted) as you just keep diligently, prayerfully pumping out true stuff about how life actually works. It really has been part of an improvement in my life (though I backslide from time-to-time!) just by the presence of reality in your work, which seems to me grace from God — who, Incarnate, spent more years nailing, cutting and sanding than he did preaching. Anyway, keep it going, E.R. Fight the good fight. Thank you so much for the wonderful thoughts and the encouragement it represents. I too am a man of faith, and strongly -- actually with 100% of my body, mind and soul -- right down to the DNA strands believe that James was right: there is no faith without works. James 14: What good is it, my brothers, if a man claims to have faith but has no deeds? Can such faith save him? 15: Suppose a brother or sister is without clothes and daily food. 16: If one of you says to him, "Go, I wish you well; keep warm and well fed," but does nothing about his physical needs, what good is it? 17: In the same way, faith by itself, if it is not accompanied by action, is dead. 18: But someone will say, "You have faith; I have deeds." I know that Paul and Peter had a "time" with James, arguing if faith is all we need, but if we do not ACT on our faith... take ACTION to right the wrongs, help the poor, feed the sick (all verbs) -- then what we have in the end are words that are not true expressions of our faith -- to serve -- to love -- to help -- to, as I like to put it, live the law with love. While TQ is in no way a theological undertaking, it does help people become more efficient, effective and powerful at delivering on their "good intentions". No question, we are saved by Grace... but leave a legacy of works/results that derive from our faith in action. This is why Success On Purpose is so important. It connects our Divine Purpose with Personal Performance. The only way we can LIVE our Purpose... is to PERFORM on Purpose. If we get this right, we will help millions of people help billions of people throughout the world! God bless and thank you Tim! Order this item today for only $59.95!